You are here: HomenextPlacesnextSchoolsnextSt Peter's School, PortsladenextNew intake - 1955? Back row l to r: Raymond Guy (deceased), ?, Alan Phillips, ?, David French, ?, ?, John Baker. Middle row l to r: Maurice Forrest, ?, ?, ?, ?, ?, ?, Malcolm Hills. Front row l to r: Jean Shipham, Linda Hayler, Geoffrey Boys, Stephen Williams, John Shipham, ?, ?. Does anyone know who the ‘?’s are? Raymond Guy and myself began our school lives together at St. Peter’s School in the mid 1950s. 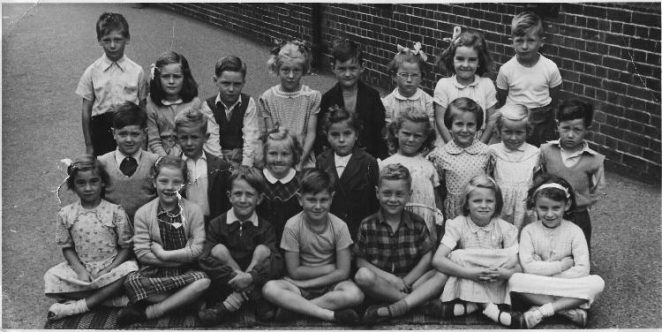 Although we were born in 1949, our start at school was delayed for a year as there had been a baby boom just after the Second World War (something to do with all those men coming home after so long away!). The sudden surge in the birth rate meant that the school system couldn’t cope so some of us were held back a year. Anyway, I still remember my first day at school. I didn’t know anyone else. I was an only child but it seemed that all the others had either at least one friend or a brother or sister, in the same class as us or another. Raymond was in a similar situation to me however. He lived with his mother and sister on the coast road in Hove (just to the west of Boundary Road) and I lived at No. 9 St. Leonard’s Avenue, Hove. After the first day or so of our mothers taking us to school, we’d walk to St. Peter’s School and home again together, and after shcool we used to play together. Later in life we both went to Benfield School together, and later still to Portslade County School for Boys. When it came to sports, Raymond was always the fastest boy in our year over 100, 200 and 400 yards. I was usually second or third fastest. Now and again I would almost manage to beat him, but never quite. How I hated him for that, although he was never big-headed. I seriously do not recall him being big-headed about anything. He was just a very nice bloke. After leaving school however, we unfortunately lost touch with each other. I saw Raymond a couple of times when he worked in a mens’ outfitters about halfway down George Street in Hove (that would have been around 1969 or 1970). Then much later, on a Friday lunchtime, I bumped into him in the NatWest Bank in Western Road, Brighton. It would probably have been sometime in 1977 or 78. Raymond was over the moon. He was withdrawing spending money to go on a belated honeymoon with his wife (and the in-laws by all accounts!). Apparently they’d been married a couple of years, but hadn’t been able to afford a honeymoon straight away after the wedding. This was to be it, and he was over the moon. Good for him. Two weeks later however, his name made unfortunate front-page news on the Evening Argus. All UK airports were fogged-in and their return flight was diverted to Belgium (I think). Sadly, the hotel where he, his wife and in-laws were put up caught fire that night. Raymond’s in-laws waited in vain outside for their daughter and Raymond to emerge from the fire. RIP Raymond. It was an honour to know you. The little girl to the left of Malcom Hills is my sister Anne Scott. As I did, she went on to Benfield and Portslade Girls School. She has lived in Yorkshire since 1980 and is a grandmother. Does anyone have a photo of the 1956 new intake? That was when I first went to the school. My great-grandmother lived next door up from St Peter’s school. Is anyone able to give me any information about her? I visited her in the early 1970s. Hi Alan, I was in Bevendean Hospital with TB when this picture was taken. I was off school for 6 months (never did catch up). Ray was best man at my wedding and Geoffrey Freeman, Peter Lansdale and I used to hang around (we used to go to the youth club at the community centre – down the village in Old Portslade) during our teenage years. Ray went on to manage a department in C&A in Brighton. I was best man at his wedding and visited Ray and his wife Beverley at their home the week before he went on his fateful holiday. I work as a Teaching Assistant at St Peters now and one of my colleagues, Jenny, also used to attend the school. Jenny was only able to tell me that the young girl in the middle row fourth from left is Jackie Garratt because she was best friends with Gillian Jackie’s older sister. I went to St Peters school in the early forties but cannot remember exactly when. Does anyone know if it’s possible to see the old school attendance records now? I do remember Don Goldsmith was my friend then and asking Norman Stevens how to spell of. Would the teacher have been Miss Cuthbert? I was at this school the year after Arthur who I remember. The teachers were Miss Conn, Mrs Lewis and Miss Clothier, the headmistress. Great to see this site. My nan lived in St Peter’s Road and my parents (and me) in Gladstone Road. They still live in Portslade. I went to St Peter’s between 1961 and 1964. My teachers were also Miss Conn, Mrs Lewis and Miss Clothier. David French in the picture was my next door neighbour. My brother Michael Clark was born in 1950 so he is round about this age but I don’t see him in the picture. In answer to my own question about school attendance records, it seems we are not allowed to view them at a records office even if they have them. Oh yes we can get one of their people to search for £25 an hour! I was born (1937) in St. Peter’s Road and went to school there. I can recall the names of all the families up until 1952. Went to St Andrew’s School, Southern Cross and from there to Windlesham, High St. Old Village. I have quite a few names from the latter as well. Left Portslade and joined the Merchant Navy 1952/1953. Have only just discovered this site, which is superb! Would be glad to reminisce with anyone who may know me. Hi. I remember (middle row 3rd from left) Carol Cornford and (5th from left) Paula Harrison. I was in the class, but not on the photo. Miss Clothier spent much of her time, accompanied by her poodle, fetching me back to school just after lunch. When gates unlocked to let ‘home dinners’ home, I would do a runner. I used to have very short days as I would lock myself in the toilet every morning hoping that mum would let me stay at home, if it got too late after nine. Happy days - not. When moved into Mrs Lewes’s class I finally settled and enjoyed all my years of schooling after that. I attended Benfield and Mile Oak School for girls. Met up with Ann Scott a few years back in Pontefract, Yorks. I attended the cold meat section of Morrisons and she served me; recognised her straight away. She like myself had moved here after marrying a Yorkshireman. 3rd from right, spotted dress, looks like Marie Lewes. I was in Miss Lewis’ class around 1959 to 1960. I remember Margaret Myers whose parents ran the pub by Portslade railway station. My brother Edward also attended St Peters. Does any one remember us, or have any photos? Hi Marie, I remember you and Edward. I remember playing with you and visiting your house. You moved away I think as I don’t remember you at Benfield. You lived in the left hand of a pair of semis near the entrance to Vale Park-not such a park in our day, more of a bomb site. I lived in St Andrews Road. Would love contact with you and to exchange photos. Please send me a message through friendsreunited or facebook- you’ll easily find me to send a message. It’s not good to leave an email address on an open site like this for security reasons and if you want to keep your computer virus free. Back row: Ray Guy, Linda Martin, Alan Phillips, Pam Thompson, David French, Margaret Hughes, Brenda Westgate, Me. Middle row: Maurice Forres,t Peter Lansdale, Carol Cornford, Jackie Garrett, Paula Harriso,n Marie Lewi,s Anne Scott, Malcolm Hills. Front row: Jean Shippam, Linda Hayler, Jeff Boyes, Steve Williams, Rob Shippam, Maureen, Greg, Cynthia Herring. Thanks for filling in the rest of the names John. Where are you nowadays? Someone said you’d gone to Spain. Keep in touch if you’d like to via ….alme.phillips@gmail.com…. (remembering to remove the …. they are inserted to stop the address being picked up by web trawlers). Hi Alan, tried to send e mail to address you gave but no go, so have sent on wanadoo. Let me know if you received it. John, I have discontinued the wanadoo e-mail address. The one quoted is correct as long as you removed the full stops at the beginning and end.